Cape Cod, Massachusetts is one of the most popular summer vacation destinations in the US, but I prefer to visit in the late summer/early fall time frame when the crowds have left and the prices decrease. If you time it right, you can stay at some of the best hotels in the area at a low rate while still enjoying the beautiful coast line. When I visited the Sea Crest Beach Hotel last month, we had two fabulous beach days with absolutely no crowds. 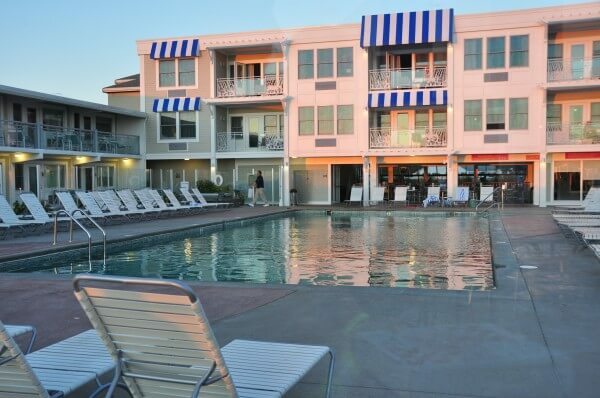 The Sea Crest Beach Hotel, located in North Falmouth, MA, is right on a private stretch of Old Silver Beach. When we checked in, it was lightly raining and most of the guests were in the indoor pool. However, after a quick trip to town to pick up a few items we’d forgotten, the weather had cleared and the beach was starting to fill up. 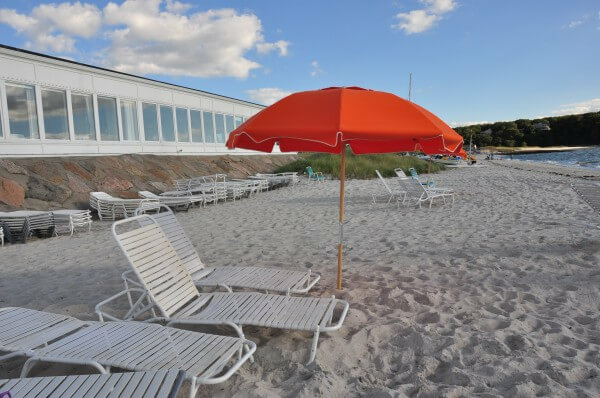 Beach valets are available to move chairs, provide towels, install umbrellas and loan sunscreen, while restaurant/bar staff regularly make trips down to the beach to fill drink and food orders. The Sea Crest Beach Hotel, which recently completed a $15 million renovation, offers 263 guestrooms and suites. Our room was a standard guest room right off the outdoor pool, but other room types include oceanview rooms, fireplace suites, and sundeck rooms. We didn’t spend much time in the room, but if you think you might be going back and forth to the room, it may be worthwhile to upgrade beyond the standard room. Rooms include a refrigerator, desk, and sitting area and offer a light, airy decor. The only negative of the room that I experienced was the bed, which wasn’t especially comfortable. The location on the beach is definitely the top amenity here, but there are also two saline pools – an indoor pool and an outdoor pool (along with indoor and outdoor jacuzzis). The pool areas are both very well maintained, and weren’t crowded at all while we were there. There is also a lobby cafe and two on-site restaurants, the seasonal Shutters and Red’s Restaurant. Named for the former manager of the Celtics (and past owner of the Sea Crest Beach Hotel), Red’s Restaurant features New England inspired food. While the prices are on the expensive side, the food and location are both excellent. We really loved our long weekend at the Sea Crest Beach Hotel, and will definitely be planning to make it an annual trip. Disclosure: We received a complimentary two-night stay at the Sea Crest Beach Hotel for purposes of review.